Today, Facebook deals went live in 5 U.S. cities including Atlanta, Austin, Dallas, San Diego and San Francisco. 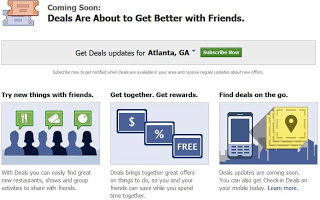 In November, Facebook announced “Facebook Deals”, and in March, the first release was sent out in Atlanta. Now, that original release is titled “Check-in Deals” (which has 15,000 likes) and the new deals site is live. Similar to how Groupon operates, local businesses offer group discount rates to groups or parties. For example, “25% off your dinner for parties of 6 or more”. Users can buy in to these deals by using their credit card or using Facebook credits. 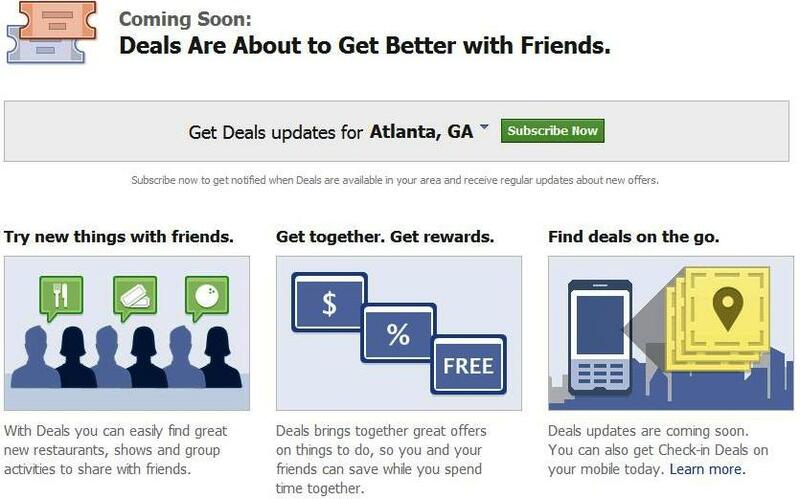 This move by Facebook is already being called the “Groupon killer” as it’s expected to take significant market share from them. “This helps businesses in 2 ways. Customer loyalty and social distribution” says Scott Witwer, Chief Experience Officer at WebiMax. Users are able to “like” specific deals, and share them in their news feeds. When a deal is bought, it will also be posted to their wall so that others can see what deals are being taken advantage of by people they know. Furthermore, users can sign up for e-mail alerts on what deals are new in the area.